If You Want To Contact Senators . . .
Marsh Supermarkets Inc. has sued its former CEO, Don E. Marsh, alleging he treated the company like “a personal checkbook” to bankroll extravagant trips, maintain vacation homes and hide personal relationships with female employees. The company claims Marsh shredded documents before he left the company in 2006 to hide his “inappropriate activities” — including personal use of petty cash and a so-called executive voucher system outside the company’s normal accounting system. Those payments, along with Don Marsh’s frequent use of a company plane for personal trips, have drawn the attention of the IRS. The locally based grocery chain plans to ask the court for millions in damages from Don Marsh, the son of company founder Ermal Marsh. It also is seeking repayment of the more than $1 million per year in “salary continuation benefits,” lifetime medical insurance and other perks it has been paying to its former CEO. Marsh, who left the formerly publicly traded company in 2006 after Florida-based Sun Capital Partners took the firm private, did not return a phone message left by IBJ today at his Carmel home.However, in a statement e-mailed by his attorney, Marsh denied the allegations. "I am extremely proud of the home-grown company that I worked so hard to build and am especially thankful for the talented employees I enjoyed working with everyday,” Marsh said in the statement. “It is very disappointing, now more than two years after my retirement, the new owner of Marsh Supermarkets would resort to such extreme misrepresentations." The allegations are false and it is clear the out-of-state, venture capitalist group ownership is looking for someone to blame for their own poor business practices which have severely impacted the company I once proudly led." I still haven't forgotten all of the stories about the wild bachelor party Marsh threw for his son in the French Room of the Columbia Club back in the 1990s. According to one person present, female entertainers made good use of the grocer's produce to entertain guests. The men's bathroom was reportedly littered with used condoms before the night was over--all from self-copulation, of course. I was a member of the club at the time. Members were talking about it for weeks after that. Word at the time was that Marsh was served with a hefty cleaning bill by the club afterwards. If you want to read the complaint against Marsh, WIBC has posted a PDF file of it here. The litany of issues raised included the proposed state bailout of the Capital Improvement Board (CIB), which operates the Pacers' Conseco Fieldhouse and the Colts' newly-built Lucas Oil Stadium. According to the Indianapolis Star, legislators have been negotiating behind closed doors on how to fund up to $15 million to keep the stadiums afloat. Ideas in play include a state-wide alcohol tax, although lead legislators have said solutions affecting only Marion County are more likely. "The individuals on the CIB clearly do not have the best interests of the people of Indianapolis in mind when they decide they need to give another $15 million of our tax money to billionaire sports owners," said Gary Welsh, speaker and author of the blog "Advance Indiana." Shella is an advocate for raising taxes to providing millions more in public subsidies to the billionaire sports team owners. Ergo, his report included no interviews with speakers at the rally or the substance of what they spoke about. If Grace had an agenda, it can't be discerned from her news reporting. Isn't that how a good journalist does it? A good political reporter would have been all over Ruth Holladay's revelation that the Pacers had just recently entertained more than 60 of Indy's corporate elites at an all-expense paid trip to an exclusive resort in Cancun, Mexico. This seems at odds with the Simons' claim that the team is losing millions of dollars each year--the impetus behind their request that taxpayers pick up $15 million they currently pay to operate their NBA franchise at Conseco Fieldhouse. Shella won't utter a word on this story. It doesn't fit with his agenda. This April Fools Day, Canal Park Advocates calls on the Indiana State Archives division of the Indiana Commission on Public Records, and the related Friends of the Indiana State Archives advocacy group, to fully disclose the public records pertinent to the need for, feasibility of, and alternatives to their heretofore secret plan to build a new state archives building on the publicly-owned 1-acre site on the downtown canal just north of Ohio Street. There is no legitimate reason to try to make fools of either the taxpaying public or of the proponents of a competing potential use for the site, as the Archives representatives are apparently attempting to do. “Some Archives employees and Friends of the Indiana State Archives, a non-profit organization, have taken great pains to keep secret their plan to build a new building on this site,” said Clarke Kahlo, a park advocates representative. "Here's my problem with this, I'm just going to come out and say it. If I have anything to say against Obama it's not because I'm a racist, it's because I don't like what he's doing as President and anybody should be able to feel that way, but what I find now is that if you say anything against him you're called a racist," Harmon told Tarts at Thursday’s Los Angeles launch of the new eyelash-growing formula, Latisse. "But it has nothing to do with it, I don’t care what color he is. I’m just not crazy about what he's doing and I heard all about this, and he’s gonna do that and change and change, so okay … I'm still dressing for a recession over here buddy and we've got unemployment at an all-time high and that was his number one thing and that's the thing I really don't appreciate. If I'm going to disagree with my President, that doesn't make me a racist. If I was to disagree with W, that doesn't make me racist. It has nothing to do with it, it is ridiculous." This is standard operating procedure. Locally, Democrats use this tactic against anyone who criticizes the corrupt Center Township gang. If you opposed former U.S. Rep. Julia Carson or now her grandson, Andre Carson, you're a racist. If you want to eliminate township government, you're a racist because some of the township trustees are black. We've even got a couple of radio talk show hosts who play the race card every time it suits their needs. The only way to transcend the race card is to push back. Those who whip it out at the drop of a pin simply don't want to debate their ideas or defend their actions. They use it to intimidate you from criticizing them. People have to push back. There are too many decisions being made that will effect the permanent future of this country. The American people and media cannot shy away from criticizing Barack Obama when his policies and actions merit our dissension. As you watch your Indiana lawmakers in the coming days, pay close attention to how they trash key articles of the Indiana Constitution governing the legislative branch of government. Section 17 of Article 4 provides that "bills for raising revenue shall originate in the House of Representatives." Forget what you were taught in your civics class about how a bill becomes law. Those rules only apply to legislation affecting ordinary people. There are special rules for the rich and privileged. Sen. Luke Kenley (R-Noblesville), who is in charge of tax and budget matters before the Indiana Senate, plans to roll out for the first time this legislative session a deal that has been worked out behind closed doors to raise taxes and divert other revenues to raise an additional $30-$40 million for Indianapolis' Capital Improvement Board. Kenley will likely stick the proposal on the state budget so lawmakers won't be allowed a straight up or down vote on it. This is classic legislative log-rolling. More importantly, the revenue aspect of this proposal will not have originated in the House of Representatives. This is also the case with a proposed fix for Indiana's unemployment insurance system. A proposal which originated in the House died there. The Indiana Senate originated its own unemployment tax proposal and sent it to the House recently. Article 19 of Section 4 specifically mandates that an act of the legislative "be confined to one subject matter and matters properly connected with it." The CIB is a political subdivision of Marion County. Taxes which support the CIB's operations and debt service are levied by the City-County Council. The Board members are appointed by the Mayor, the City-County Council and the county commissioners. The CIB, in short, is not a proper subject matter for the state budget. Yet, Indiana lawmakers won't blink an eye before inserting the CIB bailout language into the state's budget or some other unrelated legislation. When it comes to rewarding political contributors, the legislature has never let the Indiana Constitution get in its way. The Simons and Irsays have purchased your lawmakers with millions in political contributions. When they ask state lawmakers to approve higher taxes to fund a wealth transfer from the taxpaying public to their personal pockets to the tune of $30-$40 million annually, the legislature complies with their request, even as ordinary Hoosiers face their worst economic fate in modern Indiana history. Our Indiana Bill of Rights says, "The General Assembly shall not grant to any citizen, or class of citizens, privileges or immunities, which, upon the same terms, shall not equally belong to all citizens." In Indiana, if you are the owner of a professional sports team, you are entitled to hundreds of millions in public subsidies no matter how rich you are or how bad the economic conditions of the state are. Or at least that's what the people you've elected to represent you in the General Assembly and Indianapolis municipal government have decided for you. Hey, at least you're not alone. The City of Reno is treating Herb Simon's minor league baseball stadium project to another $10 million of public aid this year on top of the $30 million taxpayers there have already forked over to him. A former Simon executive told me the Simons have two mantras for conducting business: (1) cash is king; and (2) always use other people's money. Those tools of power are easy to implement when you can afford to purchase our elected officials. While the legislature works behind closed doors to provide $30-$40 million in additional annual funding for the CIB so it can pay costs the billionaire sports team owners should be paying to maintain the sports palaces, Eric Miller and his Advance America organization are focused on stopping Inidana teachers from teaching students to tolerate other students from whom they are different. On diversity training, Miller writes, "Advance America does not support any effort to teach students that homosexuality and cross-dressing is acceptable." He adds, "Advance America does not support any effort to use the public schools to indoctrinate students with regard to politically correct positions on sexuality or religions." 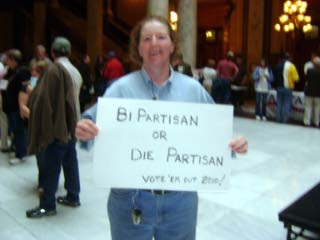 Miller urges his supporters to write Indiana senators to vote against HB 1187. On a multi-million-dollar bailout for the billionaire sports team owners, which will undoubtedly include a mix of higher taxes and tax diversions, Miller is silent. In case Miller hasn't noticed, areas of the state where he garners the most support (think Elkhart, for one), are experiencing double-digit unemployment. They could care less about his divisive social issues when they're trying to figure out how to make do on their measly unemployment check. Lawmakers can't agree on a way to fund the bankrupt unemployment insurance system without cutting benefits to the unemployed. Yet, those same lawmakers seem determined to work out a deal behind closed doors to effect the transfer of tens of millions of dollars annually to the state's two wealthiest families on the backs of ordinary working Hoosiers and at the expense of other essential state spending. Where's the outrage? Advance Indiana hears that Aaron Williams, son of Deputy Mayor Olgen Williams, is beginning a new job at the Department of Public Safety working on special projects for IMPD. Williams previously headed up the Peace In The Streets initiative which received federal funding from the Project Safe Neighborhoods program. According to the source, the job Williams is taking was not posted on the City's human resources website. By the way, in case the blogger who is playing the race card today decides to use it again, his sidekick blogger at WRTV speculated earlier about Williams' son taking a job in the administration. Abdul Hakim Shabazz is up to his old tricks again. After coming under fire in the blogosphere for his coverage of last week's Revolt At The Statehouse rally, Shabazz is blogging about someone anonymously sending a threatening e-mail. Shabazz, without posting the actual contents of the e-mail or the address used to send it, throws out a few words often used by those who organized last week's rally. Shabazz' motivation is clearly to implicate someone involved in organizing the rally without directly saying so. Shabazz also sent an e-mail to several people on Friday making the same claim prior to posting the e-mail threat claim on Indiana Barrister and his WRTV blog. Abdul should either put up or shut up. If the threat is real as Abdul claims, then he should provide the full text of the e-mail, as well as the address used by the sender. Further, he should report the threat to law enforcement if that is what it really is, although he's now hedging on that assertion. "I don’t think the person was promising physical harm," Shabazz writes in a comment on his post. "I just thought it was odd that someone thought they could threaten their way into favorable press." A four-month investigation followed, in which police, possibly with the aid of federal officials, began peeling back the identity of IndyUndercover through various e-mail addresses and Internet providers: Yahoo, Google, EOS and finally Bright House. The trail ultimately led to Abdul Shabazz, according to the affidavit, which also lists Shabazz' Downtown address and phone number. Boomershine identifies Shabazz in the warrant as the IndyUndercover blog's moderator. Judge David Altice of Marion Superior Court Criminal Division signed the search warrant. Prior to that, throughout August, Grand Jury subpoenas were issued to Google, Yahoo, etc., in the painstaking search to trace the blog back and discover who was running/writing on it. Abdul had on numerous occasions denied he was behind IndyUndercover. He even suggested e-mails that I had been sent and which I produced to him had been spoofed to make it appear he was behind the blog. That didn't stop him from fanning suggestions to other bloggers that I was behind the blog, which led to two published posts by different bloggers falsely accusing me of being behind the anonymous blog. So am I skeptical about Abdul's claim surrounding the threatening e-mail? Can a tiger change its stripes? Local blogs were agog last week about a trip the financially strapped Indiana Pacers hosted for sponsors to Cancun, Mexico, recently. The blogs reported the Pacers took 60 people on a five-day trip to an exclusive oceanside resort. These bloggers, however, had it only half right. They were outraged that the Pacers would pay for such largess while the team is asking the CIB to take over the $15 million cost of running Conseco Fieldhouse each year. But as Greg Schenkel, vice president of corporate and public relations for the Pacers, pointed out, the annual trip is a part of the sponsorship contracts the team has with various companies, including The Indianapolis Star. So the trip's costs are covered by the sponsorship dollars, he said. Schenkel would not release a list of who went on the trip, but he did say no one from the CIB or the city or state government went. They're knocking the blogs for reporting the trip in the first instance? And they think this is responsible journalistic reporting? As usual, the Star doesn't disclose its own sweet-heart, $2-$3 million loan to the CIB to pay for Conseco Fieldhouse, which the newspaper is now being asked to forgive, or the fact that it got that money it loaned to the CIB from the Circle Centre Mall in which it invested and which is run by the Simons. Like Conseco Fieldhouse, the Simons pay no rent to operate Circle Centre Mall. You pay for it; they pocket the profits. I don't know how much poking around the Star did on this subject, but increasingly in the business world such trips are being banned because of the potential for conflicts of interest with the employees handling the account. At least one Gannett employee has told me that this trip clashed with the company's stated policy. Oh well, don't expect to learn the full story on this one from the Star. If the newspaper really wanted the list of attendees, couldn't it have asked its own employee who participated in the trip for that information? And the blogger the Star took a dig at without naming in the column for supposedly only getting the story half right? Ruth Holladay is a former, long-time columnist for the paper. At least one honest person remains on the Star reporting staff. Star political columnist Matt Tully remains unfazed from the harsh attacks he came under from the elites after he criticized the Pacers for seeking $15 million a year more from the CIB to operate Conseco Fieldhouse. He offers some straight talk in his column today, including the dispelling of the notion that dire consequences will occur if the Pacers leave town. Meanwhile, the Star editorial staff thinks there should be a state-funded bailout of the CIB and taxpayers outside Marion County should help pay for it. Weeks after search warrants were executed by federal, state and local law enforcement officers on five OmniSource scrap metal businesses in town where more than 50 off-duty police officers worked, a high-ranking IMPD officer has been demoted. "The commander of the Indianapolis Metropolitan Police Department's North District is being stripped of his position in the wake of an investigation into moonlighting by off-duty officers, public safety officials said Friday," writes the Star's Vic Ryckaert. "Maj. David Allender -- one of 51 officers who worked part-time security jobs for a metal-recycling firm linked to allegations that its workers knowingly purchased stolen metal -- will be busted to his merit rank of captain and reassigned to new duties within a week, public safety officials said in an e-mail to The Indianapolis Star." It's unclear from the Star report exactly what Allender did wrong. Ryckaert quotes Newman as saying an internal investigation raised questions about his "absolute commitment to the people's business." Chief Deputy John Conley told Ryckaert, however, that Allender's demotion "was not related to any scrap-metal investigation and has no criminal violations or implications." Few details have emerged in local news media reports. A trade publication, Platts Steel Markets Daily, however, offered more specification information about what allegedly took place at OmniSource's scrap metal sites in Indianapolis. Platts reported that police recovered "folders on how to avoid anti-trust violations." The Platts report indicated that undercover police officers pretending to be auto thieves were able to sell items to OmniSource which had been altered to appear stolen. Platts also reported that OmniSource allegedly "wanted to target their competitors while employing [IMPD] officers." At the same time, Platts reported that "nothing of enforcement appeared to be happening at their yards." As I've previously reported, there are a number of conflict of interest concerns posed by the OmniSource investigation. OmniSource has hired a top flight white collar criminal attorney at Barnes & Thornburg to defend it against the allegations. The law firm performs legal services for the City in a variety of capacities. Public Safety Director Scott Newman formally worked as a partner at Barnes & Thornburg. City-County Councilor Ryan Vaughn, who chairs the Public Safety Commitee which oversees IMPD's budget and other law enforcement-related matters, is an attorney for Barnes & Thornburg. Marion County Prosecutor Carl Brizzi's office employs the services of Barnes & Thornburg. Advance Indiana recently learned that a planned civil RICO action to be brought on behalf of the public was abruptly halted. Once upon a time, public television was a place you could go to get unbiased public information. Unfortunately, WFYI's Indiana Week In Review is a complete captive of powerful special interest groups which could give a damn less about the public good. Take tonight's panel discussion on the bailout of the CIB. Host Jim Shella works for WISH-TV, which has a corporate sponsorship relationship with the Colts and Pacers. Lobbyist Mike McDaniel lobbies for the Capital Improvement Board. Lobbyist Mike O'Connor lobbies for the Indianapolis Colts. Jon Schwantes works for a Columbus, Ohio-based media company which owns WTHR, which also has a corporate sponsorship relationship with the Colts and Pacers. Star business reporter John Ketzenberger works for Gannett, which is owed close to $3 million by the CIB, a loan made to help finance Conseco Fieldhouse for the Pacers. The Star also has a corporate sponsorship relationship with the Colts and Pacers. The panel concludes that a bailout is not about the Colts or Pacers; rather, it's about the future of downtown Indianapolis. McDaniel says lawmakers and interested parties have been meeting weekly in private to discuss a deal since the beginning of the session. So much for open government. There is a consensus to raise taxes to pay for the bailout the panel concludes. The public will support it. Trust us. Later, host Jim Shella continued his tirade against a Revolt At The Statehouse rally organized by private citizens petitioning their government about a number of grievances, including the continued public subsidies for the billionaire sports team owners and the CIB bailout. "Can a rally fail?" Jim Shella asked. Schwantes, who wasn't even present for the rally because he lives and works in Columbus, Ohio, concluded it lacked focus. He did not hear a single speech, but could repeat what others told him about it. Ketzenberger attacked it for lack of a theme. "It was a nice crowd but not large enough," he added. He was not present for the rally. "A group of thespians looking for an outlet," political hack lobbyist Mike O'Connor said. "It missed the mark." This is the same guy who worked as Chief of Staff to Mayor Bart Peterson, whose administration helped create the whole CIB financial mess. McDaniel observed it had a "common theme." 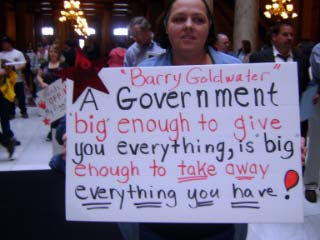 There were people there who favor less government and don't want to pay higher taxes he commented. McDaniel watched the rally from the floor above. Are you going to contribute to WFYI in the future for this kind of public television? Oh, I almost forgot. The show is sponsored by Ice Miller, the powerhouse law firm that lobbies for the Indiana Stadium & Convention Authority and a host of other clients interested in the CIB bailout. Let them pay all they want for the damn show. Just take it off the air and end the useless propaganda the self-interested panel spews weekly for the benefit of themselves and their employers. UPDATE: While we're on this theme, the IHSAA announced today that it might have to look for a different venue to hold the final four high school football finals. It seems the pill-popper, Jim Irsay, is charging $100,000 more to the IHSAA to use OUR STADIUM than the organization paid to use the RCA Dome. So much for Jim Irsay's words at the grand opening of Lucas Oil Stadium that this is "the people's stadium." Just as it's been throughout this entire legislative session, the only talks concerning a bailout of the CIB to support the sports palaces built for the Indiana Pacers and Indianapolis Colts are taking place behind closed doors. The Star reports that Gov. Mitch Daniels had a private meeting with Indiana Pacers' co-owner Herb Simon. "On Wednesday, Herb Simon, co-owner of the Pacers, met with Gov. Mitch Daniels, though details of what they discussed were not available," the Star reports. "Sen. Luke Kenley, the Noblesville Republican who is working with Rep. Bill Crawford, D-Indianapolis, on the issue, said lawmakers would meet again next week with 'all of the appropriate parties.'" "It's probably going to be behind closed doors to get a feel about where we could go," he said. In case you didn't understand that, the taxpaying public is not one of the "appropriate parties" for these "behind closed doors" meetings. Even though the Pacers are demanding that the CIB start paying $15 million a year to cover the costs of Conseco Fieldhouse or they'll have to consider moving to another city, their paid lobbyist says these talks don't concern them. "Greg Schenkel, vice president of sports and entertainment for the Pacers, said the team is 'not engaged in any active discussions (with lawmakers)," the Star reports. "We've been asked questions about our situation. This is not about the Pacers. It's about the CIB." Sure, Greg. The guv and Herb were just meeting to compare their favorite style of chaps over martinis. Gotcha. The Star added, "Colts owner Jim Irsay was unavailable for comment." Is someone hiding the pills? Gov. 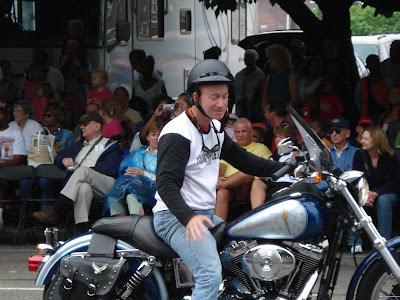 Mitch Daniels likes playing the "I'm just an average Joe" role up and down this state. The Governor and our legislative leaders have accepted a lot of campaign contributions from the Simons and Irsays. Apparently, they don't think it's asking too much to ask an average guy to pay more for a beer at the Lockerbie Pub, dinner at Mass Avenue Pub or an Eagles concert at Conseco Fieldhouse so the billionaire Simons and Irsays can keep more of our money. Daniels does, however, feel strongly about paying unemployment benefits to record numbers of unemployed Hoosiers. "The answer cannot solely be to ramp up taxes to meet Rolls-Royce benefits," Daniels said recently, referring to the average weekly benefits of $390 an unemployed person in Indiana receives. Of course, that's before the unemployed worker gets socked with ATM fees that he's forced to pay to get his benefits so some campaign contributor gets a nice payoff for installing a flawed statewide computer system to process unemployment benefits. If $390 a week is a Rolls-Royce benefit for a guy who can't find work, what does that make the hundreds of millions in direct subsidies the average joe is paying to the government to support the billionaire Simons and Irsays? House Speaker for Life Pat Bauer thinks he's got a bright idea. He wants to make the CIB a regional authority instead of Marion County only since the incompetent, unelected, self-dealing insiders who run the current CIB have done such a bad job with its financial affairs. "I think we begin with wondering if that is the structure that should be in charge of that whole operation," Bauer told WTHR. "Maybe there should be a regional structure since other counties participating giving their tax to this thing," said Bauer. Yeah, the surrounding counties got suckered into paying for Lucas Oil Stadium. Why don't we sucker them into paying for Conseco Fieldhouse, the convention center, Victory Field and every other public improvement scheme these blood suckers can conjure up to dig deeper into your wallet. I wanted to apologize to Abdul for questioning the number of jobs he claims to hold. When I challenged him to list all of his jobs, he listed the following in addition to his WXNT radio show gig: "RTV 6, Atty-Illinois, Ivy Tech, University of Indianapolis, comedian, author (will be published later this year) media consultant (out of state)." Indeed, the Star's database of state employees lists Abdul Hakim Shabazz as earning $3,760 a year at Ivy Tech Central Indiana. That's one high-paying teaching gig. Maybe he should consult with Representatives Pat Bauer, Bill Crawford and Craig Fry on how to earn big bucks working part-time for the school. "So our unelected Capital Improvement Board is in an operating hole that will get worse next year if the Pacers refuse to pay $15 million in operating expenses for Conseco. The Pacers tell us they lose money year after year. But then they pull a PR AIG. Ruth Holladay reported last week that the Pacers took 60 people, including supportive corporate elite, on a five-day excursion to Cancun, Mexico. While one might argue the Pacers are prudent to ensure their advertising base is safe in a tough market, it bothers me that representatives from WISH-TV and the Indianapolis Star attended. Holladay reports that the group was wined and dined at le Blanc Hotel and Spa, an all-inclusive oceanside resort with hot tubs in every room. The trip included side excursions for every one in attendance, and the Pacers gave the women expensive jewelry and the men fancy sport watches. The question I would ask (were I a full-time reporter) is whether the Pacers have done THIS every year, or is there something special about THIS year and this TIME that makes it necessary? Oh, sure, there's a bad economy, but there was one last year, too. MIGHT the Pacers be trying to ensure a favorable corporate climate precisely when they seek to hoist the new costs onto the taxpayers? Are we supposed to believe that there's NOT going to be any spillover from Star marketing to news/editorial? Really? Then why wasn't the story about this trip reported? Didn't every paper in the country report when the automotive executives who got bailed out fly to Congress in corporate jets? Remember when AIG execs paid for a $440,000 weekend retreat? EVERYBODY covered it. But the Star says nothing? (Look, we know the Simons are billionaires. But the rule of thumb is that if you're asking us to open the taxpayer wallet to bail you out, at least have the decency to ACT broke. Tighten your own belt first before asking us to go digging). Also, the Indianapolis Star today runs a story about the CIB/Pacers fix under the heading of "Shared Pain." Guess where? BELOW "the internet fold." In other words, you WON'T see it unless you expand for today's top stories. What ran above it? Homeless man held in blaze at complexOfficials say suspect set fire to intimidate his ex-girlfriend into coming back to him. Indy says 'no' to Louisville's Downtown light showTourism promoters wanted to project messages onto buildings during NCAA regionals. I'm glad that the United Way still has money to give and that Finish Line did well (Hurray! They can keep their Pacer sponsorship! ), but how do either of these stories have the impact that this one does on public policy? The meetings about the CIB are already being held "behind closed doors," and we can't even get the Star to front the options that are on the table so we can respond? (As an aside Advance Indiana offers an interesting view of Jim Shella's coverage of a protest rally during which AI talked about the CIB bailout. Was any of the CIB portion covered by WISH-TV? Nope). THE IDEA: Increase Marion County's 2 percent food and beverage tax to 3 percent. This would raise $18 million a year. THE PROBLEMS: Every time you go out to eat, you get socked. If I owned a restaurant outside of downtown, I'd be hopping mad because my customers get popped, and I get close to NO benefit from the Pacer attendance. (MAYBE I get the guy who stops through after the game on his way back to Noblesville). You know who else would be hopping mad about this option? Me. I like to go out, but I will start eating at home more often, and every dollar they thought they would raise in new revenue goes off the table. THE IDEA: Increase Marion County's motel/hotel tax from 9 to 10 percent to raise $4 million per year. THE PROBLEMS: Let me understand this. We need the Pacers as the "bookend" for our convention business, but we're going to make it too costly for anybody to want to actually stay in Indianapolis? If somebody doesn't think a 1% increase matters, you're sadly mistaken when you're thinking about booking convention business. You're talking an additional $1,000 PER NIGHT for a small conference of 500 people with $200 per room PER PERCENT that the hotel tax is higher than competing cities. If I'm contemplating taking a conference that will book 2,000 rooms for three days to either Louisville, which has a 15% rate, or Indianapolis, with its 9%. Assuming only $100 per room, I can save $36,000. Why in the world would we give away that kind of competitive advantage if we're trying to make tourism our thing? Also, why apply the tax to EVERYBODY in Marion County? If I owned a hotel or motel near the county borders, I'd be hopping mad because people will just stay in the doughnut counties. In other words, my customers take a hit when I get NO advantage from downtown events. THE IDEA: Raising the 6 percent admissions tax to 7 percent to bring in $1.5 million a year. THE PROBLEMS: There aren't any with this idea. Having the "users" of the service pay for the service is the only equitable way this gets done. One percent increase? I'd make it five before I'd pursue any other options. The Pacers will say, "Yeah, but if we raise the cost, we'll lose some fans." And I'll say, "Then reduce your payroll! You were the ones who let the Pacers image get tarnished by not getting rid of the trouble spots earlier." I'm tired of rewarding bad management with bailouts. Aren't you? Also, as I understand this tax, it's for ALL Conseco events, not just the Pacers. People who go to concerts or rodeos at Conseco pay more. Republicans may say, "Yes, Chris, but what about public libraries? You want us to make books available for free. Why not charge an admission fee for the central library?" Because, respectfully, some things should be public goods, such as educational information. So, no, I don't mind the "wealth transfer" that occurs when rich people have to pay so poor kids can get a place that encourages reading. Call me crazy! Are the Pacers a public good? Is a L'il Wayne concert a public good? There might be some camaraderie value, but certainly nothing that is close to a library. Sorry. THE IDEA: The Indianapolis Colts are asked to give back a share of the revenue they now get from concessions, and we get $3.5 million. THE PROBLEMS: None, in theory. The Colts should have never been offered concessions for events that had nothing to do with their product in the first place. But good luck getting that back from Jim Irsay! He's Christian and charitable, but he's not crazy. THE IDEA: Expanding taxing districts: Adding new hotels and other stadium-related businesses to a sales tax increment financing district in Downtown would generate $10 million a year. Odds: Possible. events they choose to attend, at least if you do this, you are putting the cost on those business ONLY that actually benefit from downtown events. THE IDEA: Alcohol tax: Indiana's spirits, wine and beer taxes are on the low end, but lawmakers are more interested in solutions that affect Marion County alone, not the whole state. The taxes raise about $42 million a year, which is split between the state and local governments. Odds: Unlikely. not benefit from downtown Indianapolis events. In sum, legislators who try to make the pain TOO shared might be feeling their own come election time." Jake Kelly Heading To ISU? Well, this could be the biggest news for Indiana State University basketball since Larry Bird played for the Sycamores back in the 1970s and led the team to the NCAA final four championship game in 1979 against Michigan State University and Magic Johnson. I watched every game either in person at the Hulman Civic Center or on television that year. Jake Kelly, a native of my hometown of Marshall, Illinois, is leaving Iowa to play for the Sycamores? Perhaps. "Terre Haute native Jake Kelly, who played half his high school basketball career at Marshall, Ill., and half at Carmel, has 'asked and was given his release from the Iowa basketball team,' his father and Terre Haute resident Bob Kelly told the Tribune-Star on Thursday," writes the Tribune-Star's Craig Pearson. “He wanted to be closer to home after the death of his mother this past year,” Bob Kelly said. Kelly made the trip down from Iowa to Peoria to watch the Marshall Lions play in the 2A state championship finals this year. The picture above is Kelly with my nephew, Derek Eitel, who is the starting quarterback for the Rose Hulman Engineers and an ace pitcher for their baseball team (currently ranked 24th in the nation). He and Kelly played on Marshall's basketball team together Derek's junior year of high school and Jake's sophomore year before he moved to Carmel. My twin nephews, Lucas and Logan Eitel, will be joining the Sycamores team next fall. They both were chosen for first team all state in Illinois 2A basketball. I should also say this is the about the biggest thing that has happened in my small town of Marshall. Everyone is buying their season tickets for ISU basketball. A homeless man was arrested this afternoon and now faces charges of arson in a fire that destroyed the unfinished Cosmopolitan on the Canal apartments earlier this month. Marion County Prosecutor Carl Brizzi announced the charges at a news conference this afternoon. He said Brandon L. Burns' motive was unclear but may be related to threats he made against his ex-girlfriend. Burns admitted his role to five people within hours of the fire and appeared to have been acting alone, Brizzi said. But many questions remain unanswered. Brizzi said investigators will continue to connect as many dots as possible. He said the fire appeared to have been started with small amounts of gasoline on two floors -- and was fueled by high winds that made the canal a wind tunnel in the early morning hours March 12. "We don't know why this particular building was chosen," Brizzi said. "It all seems very neat and tidy to have a homeless person admit to having started this fire. … I just want to dig deeper." Brizzi said he did not have any evidence of fraud by the project's owners, but wants the investigation to explore all possible angles. Okay, let me try to understand this. Crazy homeless guy is upset that his old girlfriend won't take him back. Later, he's down on the canal, fetches a 5-gallon can of gasoline. He then is able to enter into the construction site of the $28 million apartment complex from the canal. Apparently the site is open and has nobody securing the site, even though it is just a couple of months away from completion. He spreads the gasoline around and starts a fire inside the place. Crazy guy's version of the story is that he was with a friend, and the friend entered the site and started a bonfire and the two left. Yep, sounds about right. Case closed. Nothing more to see here. Move along. The Star's Mary Beth Schneider confirms what I learned from a legislator yesterday during our State House rally that there are discussions among legislative leaders of raising the state's alcohol tax to bail out the CIB. "Negotiations are under way in the legislature to bail out the financially struggling Capital Improvement Board, possibly by raising alcohol taxes," Schneider writes. "The CIB, which operates Indianapolis's professional stadiums, is facing a $20 million shortfall this year, and that could grow if the Indiana Pacers, which are losing money, are unable to pay their $15 million share of the costs of Conseco Fieldhouse." She adds, "The CIB would have to make up that money somehow, and already has done such things as cutting funding to the arts." You know things are really getting tough when the City's largest law firms are all announcing layoffs. Today's news that Bose McKinney & Evans is laying off 25 employees I believe is the first announcement among the big firms that includes the layoff of attorneys. "Bose McKinney & Evans LLP, the city's fifth-largest law firm, announced this morning that it is cutting 25 employees, including 10 lawyers, two paralegals and 13 staff people," the IBJ reports. This follows 11 support jobs the firm cut in January. I don't think people are being laid off at the big firms for lack of work; rather, cash flow is tight with so many clients being unable to pay their bills like they had been able to do in the past. This is forcing the firms to look for greater efficiency. 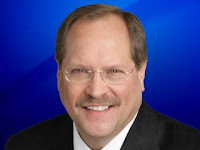 If you wanted an example of why you cannot rely on mainstream reporters for your news, you need look no further than WISH-TV's State House reporter, Jim Shella. Shella is the typical political reporter who becomes so cozy with the people he covers on a daily basis that he is unable to do a hard-hitting, investigative story for fear of offending one of his friends. You see, the job of a State House reporter is really easy when you report what the politicians like to hear. They'll spoon feed the news to you daily so you can make it home from work at a decent hour. Hard-hitting reporters have to dig for their stories because the politicians fear them and don't give up information to them easily. Let a group of outsiders step into the State House rotunda and watch Jim Shella come to life. Let's take a look at Jim Shella's report yesterday on the Revolt At The Statehouse rally. Shella began his report by attacking the all-volunteer, citizen effort to have the voices of the people heard at their State House. "State House rallies usually focus on a single issue. The one today focused on several, including some state lawmakers have no control over," he lamented. Shella interviews just two people for his report, neither of which were organizers or speakers at the event. He interviewed a very nervous supporter of Ron Paul, who like anyone without a lot of experience being interviewed on camera, struggled to find her words. Next, Shella interviewed Indiana Libertarian Executive Director Chris Spangle. Spangle has radio experience and is an articulate speaker. Shella, however, chose the only moment during his interview with him where he struggled for words to make him look like less than an able spokesperson for his party. The most reprehensible, low-life act committed by Shella, though, was what he did to attorney Mark Small, one of the speakers at yesterday's rally. Small recently penned a book about pay-to-play politics. Shella employed the dirtiest trick in TV journalism. He excised a few brief words of Small's speech and aired those words out of context to make him look foolish. "Why should we fund education . . . " You can see from the video editing that his sentence was cut off deliberately to make Small look foolish. Shella then shows some quick shots of lawmakers, looking on in curiosity or otherwise appearing to avoid the rally. There were plenty of articulate, hard-hitting and informative speeches delivered at yesterday's rally. I, for one, delivered an effective, tough speech against the bailout of the CIB to support the billionaire sports team owners. Shella's report included no clips from the many well-delivered speeches at the rally. A person standing next to Shella as I prepared to speak witnessed him directing his cameraman not to film my speech. During my speech, Shella mucked it up with Abdul Hakim-Shabazz, whose only purpose in covering the event was to try to discredit the organizers of the event because that's what his good buddy Tom John ordered him to do. Any respectable news organization would be ashamed and embarrassed by Shella's reporting yesterday. If WISH-TV wishes for any credibility for its news program, it will force Shella to publicly apologize to the organizers of the event. I'm not going to hold my breath waiting for that to happen. I suspect Shella will go on delivering the same boring dribble the State House insiders spoon feed to him. He'll keep getting all the free tickets he wants to events. And he'll make it home at a reasonable hour without ever having to break a sweat. Who cares how useless and uninformative his stories are for the station's viewers. The private development partnership behind the stadium district includes some heavy retail hitters. It is comprised of Herbert Simon, co-founder of the predecessor company to Simon Property Group Inc. that is one of the country's largest mall owners, as well as Jerry Katzoff, owner of a chain of restaurants known as Il Mulino, and his son, Stuart Katzoff. I warned you a couple of weeks ago about how conflicts of interest in the OmniSource scrap metal theft investigation threatened the administration of justice in Indianapolis. I've now learned that a $6.5 million civil RICO lawsuit which attorney Greg Garrison had prepared to file on behalf of the public was quashed at the last minute by local prosecutors. Hey, if you want to live somewhere where crimes are prosecuted, move to Chicago. The politicians up there may all be on the take, but at least there's an honest federal prosecutor who will eventually catch up with them and deliver justice. If public corruption is your gig, Indianapolis is the place to ply your trade. Several hundred faithful took time out of the work day to participate in today's Revolt At The Statehouse Rally, some driving as far as Hammond and Evansville. A big thanks to Paul Ogden and Melyssa Donaghy for the great work they did today. A special thanks to City-County Councilor Ed Coleman (L) for coming out today. I think he was the only elected official willing to show his face at the event. I gave the CIB and its owners, the Simons and the Irsays, hell for seeking a multi-million dollar state bailout so the taxpayers can shell out more money to operate their sports palaces. A new item I picked up from a sympathetic lawmaker today is a plan being circulated among the legislative leadership to impose a statewide increase in the liquor tax to finance the CIB bailout and other assorted items. That should go over well with bar owners. In Marion County, they already collect a 9% food and beverage tax to help pay for the CIB. Here's an AP report on today's rally. WIBC has a story here. There's a WTHR story here. WISH-TV's Jim Shella weighed in with a critical report, which comes as no surprise. Shella likes buddying it up with all the insider State House types and looks upon outsiders with derision. Incidentally, Jim, it wasn't a Libertarian only event as you try to portray it. There were plenty of Republicans and Democrats there as well. I'm sure he was miffed that blogger Ruth Holladay blew the lid off the fact that WISH-TV employees were among the more than 60 corporate clients entertained by the Pacers at an exclusive resort in Cancun, Mexico recently. Don't expect any follow up reporting from Shella and his State House reporter buddies. They wouldn't want you to learn the extent that they're in the tank with the Simons in pushing this bailout deal through the legislature. Media organizations profit off the Pacers and the Colts. The word I'm hearing is that the Pacers front office is blaming the leaked story on the Pacers' Cancun trip for Indy's elites on a disgruntled worker at the Indianapolis Star, one of the Pacers' corporate partners which took part in the Cancun trip. This news is not sitting well with some of the Star's rank and file employees from what I'm hearing. Workers there have already been forced to take a one-week unpaid furlough during the first quarter. The Star's parent company recently announced that employees at the newspaper will be asked to take another one-week unpaid furlough during the second quarter. Additionally, the newspaper loaned the CIB close to $3 million from the dividends it earned from the Circle Centre Mall, which is operated by the Simon family, to help pay for Conseco Fieldhouse. We recently learned from the IBJ that the CIB has asked the Star and other investors to forgive a total of $36 million owed to them. The Star has had nothing to say about the request to forgive the loan. On Friday, March 21, Father John Jenkins, CSC, phoned to inform me that President Obama had accepted his invitation to speak to the graduating class at Notre Dame and receive an honorary degree. We spoke shortly before the announcement was made public at the White House press briefing. It was the first time that I had been informed that Notre Dame had issued this invitation. President Obama has recently reaffirmed, and has now placed in public policy, his long-stated unwillingness to hold human life as sacred. While claiming to separate politics from science, he has in fact separated science from ethics and has brought the American government, for the first time in history, into supporting direct destruction of innocent human life. This will be the 25th Notre Dame graduation during my time as bishop. After much prayer, I have decided not to attend the graduation. I wish no disrespect to our president, I pray for him and wish him well. I have always revered the Office of the Presidency. But a bishop must teach the Catholic faith “in season and out of season,” and he teaches not only by his words — but by his actions. My decision is not an attack on anyone, but is in defense of the truth about human life. "'Your Indiana Pacers' are pleading for monetary breaks from the city of Indianapolis, wanting to rewrite their contract for use of Conseco Fieldhouse. They contend it costs too much to maintain the facility. "Why then did the Pacers just return from entertaining more than 60 people with a five-day excursion to an exclusive resort in Cancun, Mexico? The team's guests, along with their spouses, were corporate sponsors -- Indianapolis businesses that have supported the team financially over the years. "Included were guests from Finish Line, WISH-TV, the Indianapolis Motor Speedway, the Indianapolis Star, etc. The trip serves as a thank you with the hope that the sponsorships continue. "The group was flown to Cancun, wined and dined at le Blanc Hotel and Spa, an oceanside resort that is all inclusive -- all the food and drink one can possibly consume at one hefty price. How exclusive? Each room sported its own hot tub. And no little airline liquor bottles in those rooms. Full liters -- at no extra charge. The trip included side excursions for every one in attendance. "And to add icing to the trip, the women were given expensive jewelry and the men fancy sport watches. Special arrangements were made to watch the two West Coast Pacer games that were played during the trip. "Of course, some guests took advantage of the Pacers generosity. The Star was issued four invitations. John Cherba, the paper's director of display (retail) advertising, and his wife took advantage of the free trip to invite personal friends along. Wouldn't want to share the spoils with just anybody now would you?" Very interesting. Now you get the picture of why so many of Indianapolis' elites are so quick to support more tax subsidies for the billionaire sports team owners in this town. Shouldn't someone at the Star be reporting on this trip? Or is that another conflict of interest the newspaper's editors will just overlook? My invitation must have gotten lost in the mail. Although Caine supposedly has a law degree, she isn't a practicing attorney. I don't know what Lutz' law practice involves, but at least one council member, Ryan Vaughn, works for one of the City's largest law firms, Barnes & Thornburg. It is no secret that Barnes & Thornburg represents many clients who do business with the City. The firm also represents the City and various agencies of the county. When attorneys and law firms represent entities doing business with the City and Marion County, there cannot be any claimed attorney-client privilege with respect to the fact that the attorney or his law firm has been retained by that client to represent the client before a city or county agency. It seems to me that the Council's Republicans are exaggerating the attorney-client privilege in this context to avoid meaningful disclosure of the extent of some attorney-councilors real and potential conflicts of interest in serving on the City-County Council. The purpose of this exercise by the Ethics Committee is to determine what councilors are required to disclose on their statements of economic interest. If it is the intent of the Republican majority to shield these real and potential conflicts from a councilor's disclosure statement, then we should just dump their proposal in the garbage because that's where it belongs. When the Republican-controlled council adopted a weakened ethics ordinance last year, it decided a separate ethics ordinance should govern the disclosure requirements of councilors. The Ethics Committee has been dragging its feet on adopting a disclosure requirement for councilors for the past year. Because of its belated action, the Ethics Committee plans to delay the requirement that councilors file economic interest statements in May, along with other city-county employees and officials, for at least 60 days while they figure out how weak of an ethics ordinance they are going to pass. Watching this committee in action is very trying on a person of conscience. These people just don't get it. 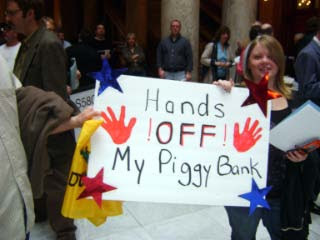 MEDIA ADVISORY--Citizen Leaders Pay Call to Legislators; Demand Reforms--Indianapolis – Attorney Paul K. Ogden, 47, today announced finalized plans regarding the taxpayer rally dubbed the “Revolt at the Statehouse” to be held on Wednesday, March 25, 2009, from 11:30 a.m. to 1 p.m. in the North Atrium. The focus of the “Revolt” is the anger the average citizen has with government at all levels which has been captured by big money interests and does not listen to ordinary citizens.Ogden cited the populist uprising in the country, which is noted on the cover of Newsweek that hits the newsstands today, as one of the reasons for the rally. A speaker list is included below. "Increasing Debt: Mortgaging our Children’s Future"– Lisa Kelly, former Libertarian Candidate for Governor"The Colts, Pacers and the Capital Improvement Board"– Gary Welsh, Attorney at Law and Publisher of Advance Indiana blog“Government Grants & Public Corruption”– Rev. Solomon, Author and Community Activist"Run Over By the Speedway Redevelopment Commission"- JoEllen Dotlich, SPEED"Pay to Play Politics, Indiana Style"– Mark Small, Attorney at Law and Author"Transparency and Accountability in Government"– Diana Vice, Lafayette-area Housewife and political activist; Publisher of Welcome to My Tea Party blog"Lobbying and Ethics Reform"– Julia Vaughn, Policy Director of Common Cause/IndianaTopic TBA--Jim Premeske, Team Hammond Taxpayers"Fun and Games in Evansville"– Frankie Neidhammer, President Vanderburgh County Taxpayers Association"How to Get Involved & Make a Difference"– Melyssa Donaghy, political activist and publisher of Hoosiers for Fair Taxation blog"A Call to Action"– Paul Ogden, Attorney at Law, and publisher of Ogden on Politics blog. Overall, residents in the poorest neighborhoods had to wait about 14 days longer to have a complaint resolved than residents in the wealthiest areas. The percentage of complaints that took 90 days or more to settle was three times higher in the poorest areas. » The biggest difference in average resolution times -- 42 days -- involved trash complaints. In the poorest areas, it took an average of 48 days; in the wealthiest areas, just six days. The percentage that took 90 days or more to settle was nearly 20 times higher in the poorest neighborhoods. » Residents in the lowest-income neighborhoods had to wait about 18 days longer for chuckhole repairs. The percentage of complaints that took 90 days or more to settle was almost two times higher in the poorest areas. The difference in response times -- most pronounced for trash and chuckhole complaints, which are handled by the Department of Public Works -- caught city officials off guard. Amos Brown will have a field day with these statistics. Someone in the Ballard administration had a bright idea to close five public pools for the entire summer season this year for much-needed repairs. Ballard got blasted by residents in the Bethel Park area who are irate about the decision. WTHR's Mary Milz has a good story about what transpired. Crazy Larry (the guy who wears a paper bag on his head as a hat) brought Mayor Ballard to his feet when he accused the Mayor of being a racist. The Mayor shot back that the pools were being closed because the problem had been ignored for ten years and he's finally doing what needs to be done. Deputy Mayor Olgen Williams is caught on tape in a heated exchange with another resident in attendance at the meeting, which makes Williams look bad, not that looking bad is a hard thing for Williams to do. Mayor Ballard is right about the problem with the pools being ignored for too long. Mayor Peterson allowed the parks to deteriorate during his eight years as mayor, choosing instead to spend the money awarding tax give-aways to his wealthy contributors, like the $20 million for the Conrad Hilton and the $25 million for Simon's corporate headquarters, to name a couple. Where the Ballard administration is dead wrong is its determination that five pools must be closed for the entire summer to make the needed repairs. I know enough about construction work to know that there are at least six months out of the year when repairs can be made to these pools other than the relatively short, 90-day period they are open during the summer. The administration is being disingenuous with the public about the need to close all of these pools at the same time for repairs. The repairs, which are estimated to cost $4 million, are being done in this fashion to save money, pure and simple. The closing of these pools, primarily in middle and lower-income neighborhoods, means the loss of summer jobs for the City's youth. Milz' reports notes that IPS is closing schools in some of these same neigbhorhoods. The administration's decision to close the pools has nothing to do with race as suggested by Crazy Larry. It is, however, a reflection of this administration's priorities. You know that Conseco Fieldhouse and Lucas Oil Stadium would never be shut down during the season for repairs. While the Mayor is squeezing the park's budget, he is asking the legislature for additional taxing authority and funding to pay for the operating costs of Lucas Oil Stadium and Conseco Fieldhouse so the billionaire sports team owners don't have to absorb a dime of those expenses. Ballard already announced he is hiking fees to use the city's pools. As it always seems to be the case in this town, the common folks get the short end of the stick. The Indiana Pacers franchise needs $15 million a year beginning in 2010—presumably from the public—to fund the operation of Conseco Fieldhouse. The franchise says it can’t afford to operate the venue, where it claims to have lost money every year but one since moving in 10 years ago. That’s madness. We have a hard time understanding how the franchise could be such a money loser. The Pacers pay essentially no rent on the publicly owned fieldhouse but benefit from the more than 200 ticketed events held there every year—everything from basketball games to rock concerts. We appreciate that the team hasn’t issued any ultimatums in this latest round of troubles, but it’s frustrating that taxpayers are once again being asked to subsidize a private enterprise that’s already getting a pretty good deal in the form of free use of a state-of-the-art entertainment venue. And because Indianapolis has so much invested, why wouldn’t the Pacers give the city a cut of the upside? The Simons bought the team for $11 million back in 1983. A year ago, Forbes magazine valued it at more than $300 million. If the city is truly a partner, it should be rewarded if sometime down the road the franchise changes hands. So essentially the IBJ concludes we should pick up the $15 million a year tab for the Pacers, even though all evidence would point to the claim that the franchise is losing money and has lost money in 9 out of the past 10 years as being completely false, as long as the CIB is offered some cut of a future sale of the Pacers. It looks like the IBJ has concluded the same thing I've already concluded. The Simons plan to sell the Pacers. They are simply trying to extract this additional subsidy for the team to bolster the team's selling price. The Simon family's crown jewel, Simon Property Group, is sinking fast from the mountain of debt it has piled up over the years. David Simon's plan to issue more stock as a ruse for raising money to pay off some of that debt went over like a fart in church with investors. I see the IBJ's point in asking for this concession from the Simons, but if past is prologue, this would become an empty promise. The CIB already has a right of first refusal to acquire the team if it is sold, but it can't begin to afford to pay the purchase price. You know exactly what will happen. A potential purchaser will say he wants to move the Pacers to another city if he buys the team because the team isn't profitable enough here. The Simons will come to the CIB and tell them that they can guarantee the new team owner will keep the team in the city if the Pacers are let off paying the City its cut of the selling price so the Simons can reduce the purchase price from something like $350 million to $300 million. All of the negotiations with professional sports team owners end one way, and it's always to the advantage of the team owner and not the public. If the choice is between no Pacers and a Pacers team plus an additional direct subsidy of $15 million a year, it's a no brainer. Farewell, Pacers. Every player -- including the Colts, Pacers, businesses, city and state governments -- will have to sacrifice something to find a sustainable model for operating Lucas Oil Stadium, Conseco Fieldhouse and other Downtown venues. Second, the General Assembly must address the deficit before the end of April. The state took the lead in building Lucas Oil Stadium; it must not abandon the city now with operating costs pushing the CIB to the point of crisis. Third, although it's clear that a range of options, not one overriding solution, will have to be employed to close the budget gap, the state and city must protect the region's convention business. In other words, only the taxpayers will wind up paying for this bailout. What a shame, then, if we would somehow lower the bar, lose the momentum and sacrifice the national identity built in the past 40 years by retreating to the India-no-place of 1969. But no less is at stake as we seek creative and collaborative solutions to the funding problems confronting the Capital Improvement Board. The issues extend far beyond Conseco Fieldhouse and Lucas Oil Stadium and their primary tenants, the Pacers and Colts. This is about sustaining the vibrancy of Downtown, maintaining and growing jobs and creating an environment that is attractive to business. The two then go on to throw out the phony ecoomic impact numbers they are always throwing around. Let me explain this to Dorson and Welsh (who is no relation, thankfully). The massive amounts of public spending in the downtown one mile square over the past 40 years has done absolutely nothing to stem the tide of corporations that have closed or moved their corporate headquarters and taking their high-paying jobs elsewhere. In fact, it has done nothing to stem the exodus to the suburbs. Our population has remained virtually stagnant since 1970. Guys like Dorson and Welsh have a great gig going on. They convince stupid Marion County residents to continue paying tens of millions in tax dollars to the CIB year after year, and they get these great paying entertainment-related jobs that offers plenty of travel around the U.S., dining in all of the fine restaurants and overnight accommodations in five star hotels. Guys like this have been so successful that we spend more money on the CIB than we spend providing fire protection. We spend four times on the CIB than we spend on our city's parks. And we spend more on the CIB than we spend on the prosecutor's office, the public defender's office and the entire Marion County court system combined. A final note to Welsh. Your former Seattle home lost its Sonics' NBA franchise to Oklahoma City. Think about it. Are all of the young, well-educated professionals going to stop moving to Seattle because the Sonics are no longer there and start moving to Oklahoma City instead? If you asked young, well-educated professionals across the country where they would rather live. Do you think they would pick Seattle or Indianapolis? Can You Believe What Simon Says? The Death Of The Marion County Republican Party?